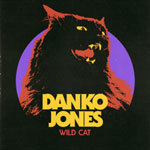 Danko Jones' music pretty much comes out like it so often does and this trio once again puts out a record with almost entirely cool songs, topped with a couple of great ones that are truly able to find their way straight to your heavy rocking soul. The record basically comprises groovy, heavy rock overall, with some choruses to scream your lungs out to on the band's live sets. Wild Cat is without a doubt yet another solid effort from these Canadians and I surely can't find any reason to why fans to this unit would ever reject this stuff.